Orchid potting is not as frightening as it may sound. However, it is also not as commonly necessary as you might think. You see, orchids are known for their expansive roots. Think of them as arms, reaching and exploring out of the bottom of the pot, looking for nutrients. These creeping and crawling roots are the orchids way of attach itself to its surroundings (though in nature, these roots are usually clinging to trees, not to table legs!). But believe it or not, if you have exposed roots, that’s not reason enough to repot the orchid. You should repot the orchid when there is no room left in the pot for the next growth and when the soil within is no longer providing nourishment for the plant. In addition, if the roots are rotting, due to being wet too often, this is another instance when orchid potting becomes necessary. Orchid repotting does not take long. In fact, you can do it within just seven simple steps (even if you are not someone with a green thumb! 1. Gather your tools. You will need potting medium, a new pot and cutting tools that you have sterilized. Yes, sterilized! Though most people do not realize it, like surgical procedures, all tools should be sterilized before you perform your “operation” on your delicate orchid. 2. Tip the pot on its side and pull the plant out of the pot, without breaking up any of the substance at this point. Run your fingers gently through the potting medium to remove as much of it as possible. Loosen up the root ball with your fingers to get the entire natural medium out. 3. Using a cutting tool, remove any roots that are dark brown, water-logged or that are black. These are not healthy for orchids. Healthy orchid roots are white or a light brown color. 4. Take off any back bulbs, which are bulbs that are still alive, but have lost all of their leaves. You can repot these in another pot (though they should be in their own space.) Be sure to trim off any old, dead leaves and bulbs as well. 5. Set the plant down and focus on the new pot. It, too, should be sterilized and dry before beginning. You should place Styrofoam peanuts in the bottom of the pot with a mixture of your potting medium. 6. Fill the pot with the medium about half way. How do you know what to use? The best plant material available is a good way to go (organic whenever possible.) Choose a well-balanced product. If you’re unsure, ask your orchid supplier what the best medium is for your orchid. 7. 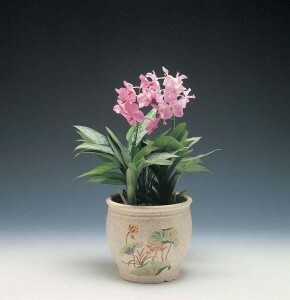 Position the orchid in the middle of the pot if it is a terrestrial or monopodial. If you have a sympodial orchid, place it to the right of the middle. And if you don’t know what type of orchid you have, ask your local garden center or check online resources that describe the leaves and roots of the orchid. Orchid potting does not require many expensive materials, or a lot of time. However, you do want to ensure that you allow the roots to grow and spread. It is rarely possible to contain them. Allow the roots to come out the bottom as they touch and feel their way around your home. And always remember, orchid potting like this should only be done when necessary. And to learn even more orchid potting tips, download my totally FREE 5-Day Orchid Insider training course by going here: Orchid Care Insider Strategies. Discover orchid care secrets that most orchid growers never know about quickly and easily growing orchids.